If you think great companies don’t let their entrepreneurs leave…you’re totally wrong! 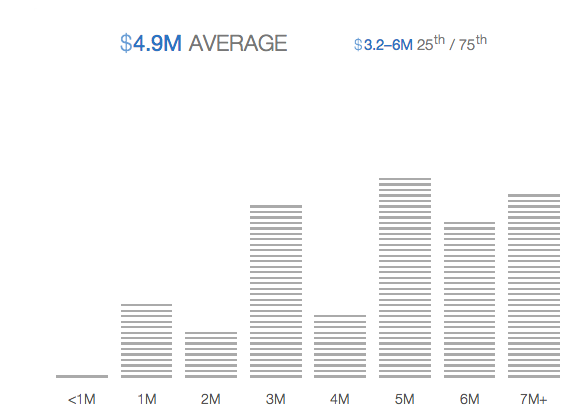 Let’s start with this AngelList graph showing Google alumni creating new businesses for a $4.9 million average (each line is a startup having at least one Google alumni). Either Google is facing a terrible brain drain or this is just business as usual and more entrepreneurs being hired will make up for the ones leaving. 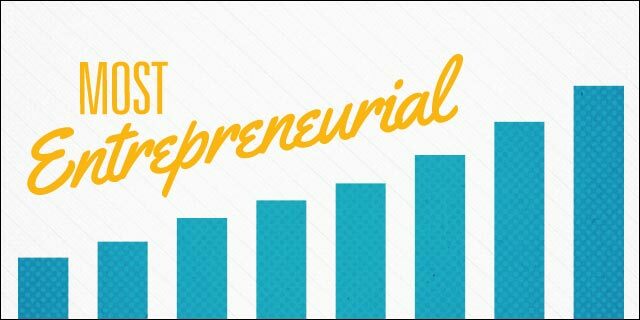 In other words, the entrepreneurial input is equal to the entrepreneurial output and in the case of Google, it is relatively high: 1,390 alumni listed on AngelList / 47,756 Google employees = a ratio of 2.91%. Of course, using this ratio as an index has a lot of bias, but by looking at that ratio for 30+ large companies, it seems indeed that the most entrepreneurial corporations are not doing too bad! This ratio is not constant, which raises the obvious question: why would some corporations produce more entrepreneurs than others? The more entrepreneurs you have in an organization, the more fragile it is! 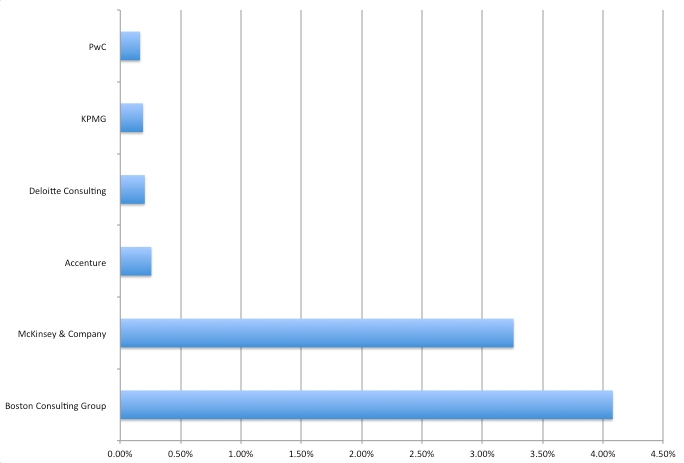 Looking at this graph, it would seems that Yahoo might just be the most entrepreneurial company of my sample. This is the result of a dramatic drop between 2012 and 2013. 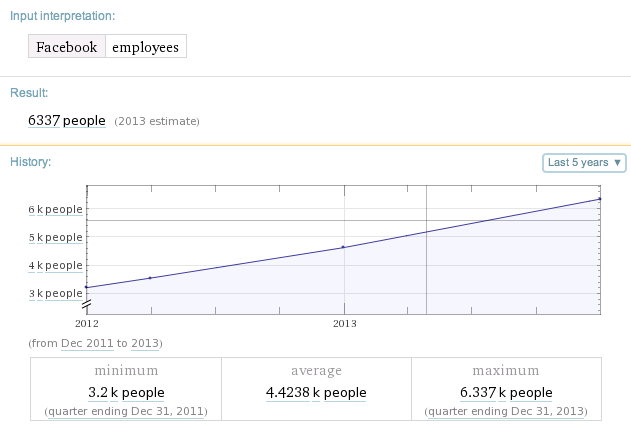 Calculating this ratio using the mean of Yahoo employees for the past four years gives us 4.94%. That is high, but my explanation here is just pure brain drain. If I exclude Yahoo, we now see Facebook might just be the most entrepreneurial of all corporations. 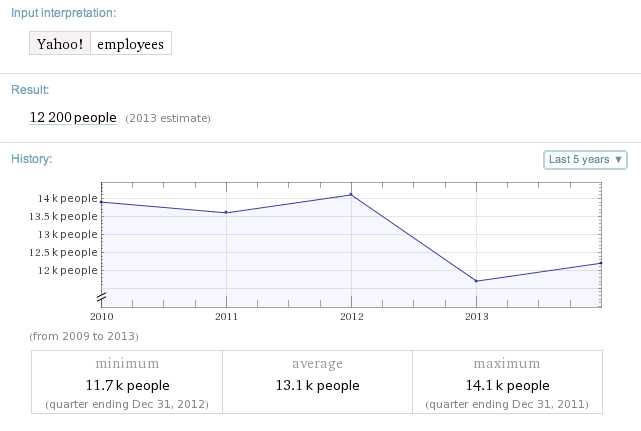 Just to be sure this is not another entrepreneurial brain drain, I’ve checked its employee headcount over the year. Hiring has been increasing constantly (and linearly) for the past years, therefore this is not a brain drain. 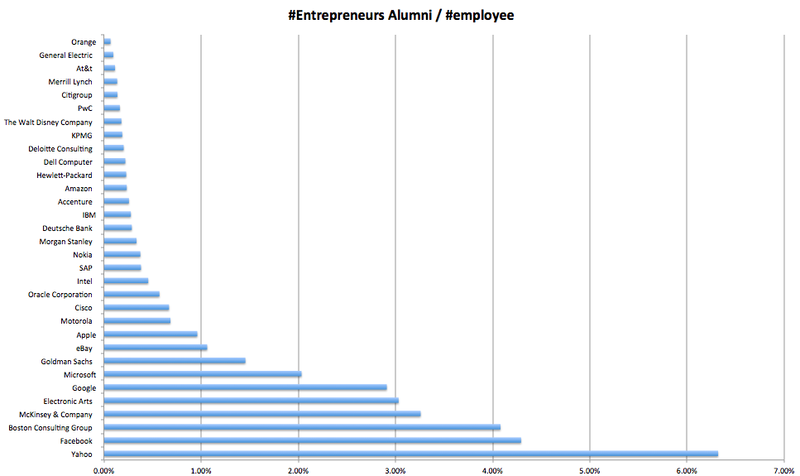 Most likely, Facebook might just be a great magnet of entrepreneurial talent! My biggest surprise might just be McKinsey and BCG. Not only do they have one of the highest entrepreneurial ratios of my study, but they also are one of the oldest businesses (founded in 1926 for McKinsey). Talking to some of my friends working there, it’s not surprising: McKinsey always had an internal politics of pushing their consultants to leave and lead or launch new businesses. Amazon, with a ratio of 0.24%, is far from being entrepreneurial. This might just be the result of Jeff Bezos intentionally looking for people who will stay and not leave Amazon (therefore not entrepreneurs). Bezos is the entrepreneurial spirit there – he is the visionary. It might just become challenging in the long-term for Amazon the day Bezos leaves, but I’m sure he’ll have a brilliant plan for that, too! It’s obvious looking at the ratio by industry that strategic consulting firms like McKinsey and BCG are way more entrepreneurial than their counterparts who came from the audit world (KPMG / PwC / Accenture). Corporations are like a crystals: they might look solid, but they really are fragile to changes. The process of growing from the startup phase to the end of the scale-up phase makes a corporation more efficient. But these processes are based on assumptions in a world where technical disruption is everywhere, and the half life of these process is most likely shrinking. If entrepreneurs were a medication – and if you’re a big fan of Nassim Nicholas Taleb’s latest book – it seems they might just be the ingredient for your corporation to become anti-fragile. This is an important hypothesis as we also observe a higher churn rate in current S&P 500 companies (Innosight projects that at current churn rate, 75% of the S&P 500 will be replaced by 2027). We are going to need a cure to this turnover. Classic management tools like BPR (Business Process Re-engineering) are not efficient in highly unstable environments. As well described by The Power of Pull, small moves from the bottom matter more than the big ones. Like any living cells, large corporations need to use technology to allow them to be more agile and lean. This is actually totally in line with management theories. When Drucker introduced modern management practices, he described them as a technology! In the next 20 years, we will see large corporations trying to be more entrepreneurial looking to become anti-fragile. Studying and comparing more accurately the entrepreneurial output and ratio of each corporation will allow us to make some predictions regarding their relative future instability. Always remember that entrepreneurs are the ones who get fired! To conclude this first study, it is important for large corporation leaders to be aware that entrepreneurs are very different for one main reason: they will always leave your company. This is not something you can or should stop; this is just a universal force of nature. Don’t fight it, embrace it, and you might still be around in 25 years.